Makeup has been around for several centuries. The Egyptians were the first on Earth to use cosmetics to beautify themselves. A lot has changed since those days. Several new methods, tools and techniques have been developed to apply makeup as smoothly as possible. The patented makeup method that uses compressed air to apply a fine mist of makeup evenly over a surface is called airbrush makeup. The smooth texture offered by Airbrush makeup makes it perfect for HDTV, digital photography and special occasions like wedding days. Suitable for all types of skin and any age. It can be custom blended to create different foundation colours. The makeup used is hypoallergenic as well as fragrance free. It can be used to create a flawless complexion. It is water resistant and lasts for 14 hours. Airbrush makeup is silicone based and sweat resistant. A basic airbrush makeup kit includes a stainless steel gun as well as a hose that can be attached to a tiny air compressor. You will notice a cup on top of the airbrush gun. This is where the makeup is dropped into. The airbrush gun has a needle size opening through which the makeup is applied. Once the trigger on the gun is pulled, it releases the makeup in the form of a fine mist which can be applied on any surface without trouble. Since airbrush makeup is weightless, customers often point out that wearing it is a breeze. It is often recommended for people who usually do not wear too much makeup so that they do not have trouble with it on their special day. Many beginners make the rookie mistake of trying to use traditional makeup in an airbrush gun to get the same effects. Unfortunately, this does not work very well as the nozzle of the gun is very narrow and traditional makeup is not watery enough to give a smooth finish after application. Since the makeup applied using an airbrush gun is very fine and smooth, you have the option of opting for a sheer or full coverage. If you choose full overage, it is done gradually, and you will be able to notice the difference after a few passes are made over the skin using the airbrush gun. However, dark spots and blemishes are covered with a concealer before the airbrush makeup is applied to get a more natural finish. Experts recommend moisturizing the skin well first to avoid dry patches based on airbrush makeup reviews. Since the makeup is used along with an airbrush gun is silicone based, it would be preferential to choose a silicone-based primer for your skin. The durability offered by airbrush makeup is one of the main reasons it has gained plenty of popularity in the beauty industry. It also means fewer touch ups during long photoshoots, which can save plenty of time, especially when the photographer is trying to capture the perfect shot in the shortest time possible with outdoor light. Why Is Airbrush Makeup Better For HD TV or Digital Photography? If you are wondering why airbrush makeup seems to be preferred over traditional makeup for hi definition TV or digital photography you have come to the right place. Technology has made many advances in the recent years. This has made it possible to offer better resolution pictures to the viewers. HDTV offers up to 1080 lines made up of tiny pixels. This means more clarity and better picture quality. As a result, this leads to a better representation of the model on the screen and in photographs, leading to more scrutiny. Since the airbrush applies makeup in a dot pattern, which is similar to how the camera reads a face, the makeup artists are able to do a better job of covering up blemishes and offering a smooth finish. The million dollar question at the end of the day is who does the better job? Traditional makeup or airbrush makeup? Interestingly, each type of makeup is suited to particular situations. If you are looking for a longer lasting makeup that looks good n photographs and video, airbrush makeup is your option. However, if you are looking at smaller events, that last only an hour or so, you are safe to go with traditional makeup. The best thing about airbrush makeup is that it does not require frequent touch-ups and is water and sweat resistant as well. This is one of the reasons most makeup experts prefer to use it on brides for their special day. 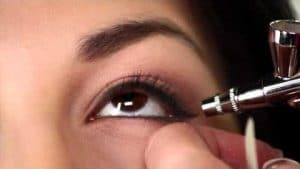 While many experts tend to use a freehand technique while applying airbrush makeup, there are a few aspects to be taken into consideration to get a smooth finish. A forward-back or circular motion can help apply the makeup with a natural finish. Since the pressure applied to the trigger determines the pressure with which the mist comes out of the nozzle, a softer touch can help while applying a sheer look. If you are applying a full coverage, experts recommend still going ahead with a lighter touch, however applying multiple passes to get a completely smooth look that covers all blemishes and spots. 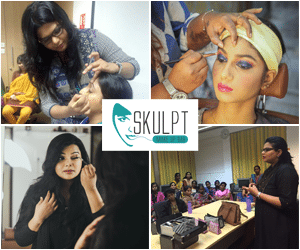 You also have the option of creating a customized foundation by mixing different colours to get the right blend using the cup at the top of the airbrush gun. Since airbrush makeup is said to be water resistant, you might be worried about how to remove it from your skin at the end of the day. Well, never fear, this magical product can be removed completely with any silicone based makeup remover, or you can wait till it comes off naturally after a couple of hours. The best airbrush makeup kit usually comes with a remover to help you remove the makeup once you are done. However, it is always best to remove it from your skin after it is needed no longer, to let your skin recover. Since airbrush makeup is very fine, it lets your skin breath, bringing any damage caused to your skin to a beautiful zero!